Let’s remember to continue praying for the persecuted church. By some reports, there are 100,000 Christians martyred each year around the world. This number does not include the many more number of Christians who are imprisoned because of their faith. In Revelation 6:9-11, we are given a glimpse of heaven where the martyrs cry out to God for vindication. When Jesus returns, He will conquer all of His enemies and grant justice to His chosen ones. In the meantime, we must endure injustice and persecution. Let’s stand by our brothers and sisters who are suffering for the sake of Christ by praying for them on a regular basis. 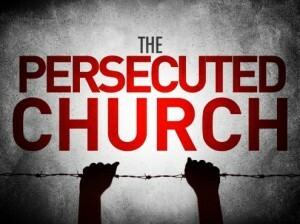 For regular updates on the persecuted church, visit the Voice of the Martyrs at www.persecution.com.